Ralph Barnaby was a multi-talented and a multi-faceted personality - pioneer glider pilot, Naval aviator, author and lecturer, historian, artist and sculptor, "Raconteur extraordinaire", musician and an SSA Founder. 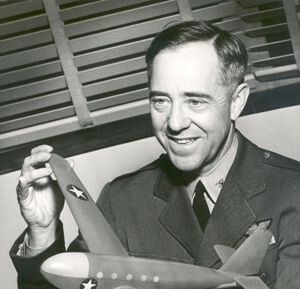 He served as SSA President, Vice President and Trustee of the National Soaring Museum. Based on Otto Lilienthal's pictures and plans, in 1909, at age 16, Ralph Barnaby designed, built and flew a "hang-type" glider in Roxbury, CT. The Wright Brothers concepts were not popularly known at the time. He enlisted in the Navy in 1917 and received orders to MIT for ground school. He hoped for flying duty but instead spent WW I as a Naval aircraft inspector. He transferred to the regular Navy in 1920. 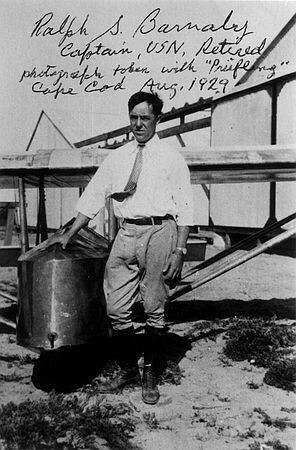 He qualified for United States Soaring Certificate #1 ("C" badge) on August 18, 1929 at South Wellfleet, Cape Cod, MA. This flight, in a Prufling glider, lasted 15 minutes and 6 seconds and exceeded Orville Wright's record of 9 minutes and 45 seconds. Orville Wright signed the certificate. Barnaby received international attention in 1930 when he was dropped and flew from the dirigible USS Los Angeles over Lakehurst, New Jersey, in the same German manufactured Prufling glider in which he had earned U.S. "C" #1. In 1934 he was assigned to Pensacola, FL, as Assembly and Repair Officer with additional duty as advisor for an experimental glider training course. He had been denied Naval Aviator wings due to less than 20/20 eyesight but kept flying hoping he could persuade the Medical Officer to grant a waiver since he could be seen often flying both gliders and power with his civilian certificate. One day the Medical Officer told him he had badly infected tonsils that had to be removed. Barnaby agreed on the condition that the doctor sign the waiver. gliders. In 1947, he retired from the Navy after 30 years and joined the Franklin Institute as Director of Engineering. He was "Curator Emeritus" or "Keeper Emeritus" at the time of his death in 1986. In 1954 he became the first American to receive the FAI Tissandier Diploma. He received SSA's highest award, the Eaton Trophy in 1960. He received many Navy and other awards including the NAA Elder Statesman (1960). He endowed the Barnaby Archivist Chair at NSM which continues as the Barnaby Lecture of which he gave two (1973 and 1983). He was an author of many scientific papers and articles as well as the author of books. He loved music and was a talented sculptor with his plaque for the Wright Brothers installed at Kitty Hawk in 1963. His last sculpture was completed in 1985 at age 93. It was a self-executed bust. The NSM Trustees felt the work in progress reflected a very somber expression which the Trustees did not associate with Barnaby. The completed bust has a smile. To quote the Trustees, "That's really how we best remember him." Ralph touched and inspired many people in all walks of life. Ralph Barnaby with Prufling glider.